There was no lack of interesting games this day. The day ended with defeat of the leader and favorites losing the games. Here is the last day review presented by ESL. The most crucial game of the last day was another loss of top-ranked Long Island Nets (19-10) in Uniondale on Friday night. Hosts were defeated by second ranked Salt Lake City Stars (15-14) 109-96. It may be a crucial game in the contest for the top position in the league. Salt Lake City Stars looked well-organized offensively handing out 31 assists. Great defensive blocking was one of the keys in this match when Salt Lake City Stars made 8 blocks. It was a great evening for guard Isaiah Cousins (193-94, college: Oklahoma) who led his team to a victory scoring 21 points, 5 rebounds and 8 assists. Forward Tanner McGrew (203-93, college: W.Virg.Wesl., agency: Duran International) helped adding 25 points and 4 assists. The best for the losing side was center Alan Williams (203-93, college: UCSB) with 27 points, 5 rebounds and 4 assists. Salt Lake City Stars maintains second place with 15-14 record having just one point less than leader Windy City B. Long Island Nets at the other side still keep top position with ten games lost. Important game to mention about took place in Bismarck. Second ranked Kings (18-11) saved a 1-point victory on the road edging leader Warriors (22-8) 105-104 on Friday evening. It may be a crucial game in the contest for the top position in the league. It was an exceptional evening for Nigerian forward Daniel Ochefu (211-93, college: Villanova) who led the winners with a double-double by scoring 23 points and 12 rebounds. Cody Demps accounted for 13 points and 7 rebounds. Kings' coach allowed to play the deep bench players in such tough game. 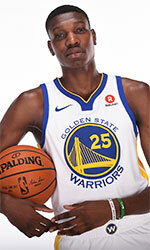 Guard Kendrick Nunn (190-95, college: Oakland, agency: Pensack Sports) came up with 30 points for Warriors in the defeat. Kings maintains second place with 18-11 record having just one victory less than leader Windy City B. Warriors at the other side still keep top position with eight games lost. Very important is a home loss of first ranked Magic (17-11) against fourth ranked Greensboro Swarm (13-16) on Friday night. Host Magic was defeated by Greensboro Swarm in a tough game in Lakeland 98-106. It ended at the same time the four-game winning streak of Magic. The best player for the winners was Anthony Barber who scored 25 points, 5 rebounds and 5 assists. At the other side the best for losing team was Amile Jefferson who recorded a double-double by scoring 17 points and 17 rebounds. Both coaches used bench players which allowed the starters a little rest for the next games. Greensboro Swarm maintains fourth place with 13-16 record. Loser Magic still keeps top position with 11 games lost. They share it with Capital City Go-Go and Raptors 905. Greensboro Swarm will meet Blue Coats (#4) in the next day. Magic will have a break next day. Very significant was Capital City Go-Go's (#2, 17-11) victory against 3rd placed Drive (12-16) 115-106. It was a good game for Gary Payton II who led his team to a victory with a double-double by scoring 25 points and 13 rebounds. Drive's coach rotated ten players in this game, but that didn't help. Capital City Go-Go (17-11) keeps a position of league leader, which they share with Lakeland M. and Raptors 905. Drive at the other side keeps the third place with 16 games lost. Very significant was Knicks' (#2, 18-14) victory against 3rd placed Hustle (18-12) 108-97. It ended at the same time the two-game winning streak of Hustle. It was a great evening for Kadeem Allen who led his team to a victory scoring 20 points, 5 rebounds and 6 assists. Hustle's coach tested ten players, but that didn't help to avoid defeat in this game. Knicks maintains second place with 18-14 record having just five point less than leader Windy City B. Loser Hustle keeps the third position with 12 games lost. Knicks will face league's second-placed Sioux Falls Skyforce at home in the next day and it will be for sure the game of the week. Hustle will play against Maine Red Claws in Portland and it may be a tough game between close rivals. There were no shocking results in the rest of the games of day 75: Wisconsin H. won against Canton C. on the opponent's court 117-105. NAZ Suns was outscored by Texas L. in a home game 107-126. Delaware BC recorded a loss to Sioux Falls S. on the road 134-123. Austin S. was crushed by Rio Grande VV on its own court 98-129. South Bay L. beat Iowa W. in Los Angeles 117-101. We cannot really consider it an upset in the game between close teams when 4th placed Canton Charge (12-17) was defeated at home by fifth ranked Herd (7-22) 117-105 on Friday. Herd outrebounded Canton Charge 48-35 including 38 on the defensive glass. They looked well-organized offensively handing out 26 assists. It was a great evening for forward Christian Wood (208-95, college: UNLV, agency: Pensack Sports) who led his team to a victory with a double-double by scoring 28 points, 15 rebounds and 4 assists. Guard Nick Johnson (191-92, college: Arizona, agency: BeoBasket) helped adding 16 points, 7 rebounds and 11 assists. The best for the losing side was forward JaCorey Williams (203-94, college: Middle Tenn.St.) with a double-double by scoring 25 points, 12 rebounds and 6 assists and guard Scoochie Smith (188-94, college: Dayton) scored 23 points, 5 rebounds and 6 assists. Five Herd and four Canton Charge players scored in double figures. Canton Charge's coach tested ten players, but that didn't help to avoid defeat in this game. Herd have a solid series of three victories in a row. They maintain fifth place with 7-22 record. Loser Canton Charge keeps the fourth position with 17 games lost. Herd will have a break next day. Canton Charge will play at home against the league's second-placed Fort Wayne Mad Ants (#2) and it may be a tough game between close rivals. Very significant was Capital City Go-Go's (#2, 17-11) victory against 3rd placed Drive (12-16) 115-106. Capital City Go-Go made 23-of-29 charity shots (79.3 percent) during the game. They also forced 19 Drive turnovers. Their players were unselfish on offense dishing 21 assists. It was a good game for guard Gary Payton II (190-92, college: Oregon St.) who led his team to a victory with a double-double by scoring 25 points and 13 rebounds. Guard Noah Allen (201-95, college: Hawaii) contributed with 20 points and 9 rebounds for the winners. Guard Kenneth Smith (190-93, college: Louisiana Tech) answered with 18 points and 6 rebounds and guard Dakarai Allen (196-95, college: San Diego St.) added 21 points in the effort for Drive. Five Capital City Go-Go and four Drive players scored in double figures. Drive's coach rotated ten players in this game, but that didn't help. Capital City Go-Go (17-11) keeps a position of league leader, which they share with Lakeland M. and Raptors 905. Drive at the other side keeps the third place with 16 games lost. The game between closely ranked teams ended with fourth ranked Texas Legends' (12-20) road victory over 5th ranked Northern Arizona Suns (6-25) 126-107 on Friday. Texas Legends forced 19 Northern Arizona Suns turnovers. They shot the lights out from three sinking 16 long-distance shots on high 59.3 percentage. Texas Legends looked well-organized offensively handing out 31 assists. Northern Arizona Suns were plagued by 28 personal fouls down the stretch. It was a great evening for guard Gary Trent-Jr (198-99, college: Duke) who led his team to a victory scoring 33 points (!!!) and 6 rebounds. Guard Keith Hornsby (193-92, college: LSU) helped adding 27 points. The best for the losing side was guard George King (198-94, college: Colorado) with 19 points, 6 rebounds and 4 assists and point guard Jawun Evans (185-96, college: Oklahoma St.) scored 12 points and 9 assists. Both teams had five players each who scored in double figures. Both coaches tested many bench players and allowed the starting five to rest. Texas Legends have a solid series of three victories in a row. They maintain fourth place with 12-20 record. Loser Northern Arizona Suns keep the fifth position with 25 games lost. Texas Legends will face league's leader Rio Grande Valley Vipers in Hidalgo in the next day and it will be quite challenging to get another victory. Northern Arizona Suns will play on the road against the league's leader OKC Blue (#1) in Oklahoma City and hope to win that game. Very significant was Knicks' (#2, 18-14) victory against 3rd placed Hustle (18-12) 108-97. It ended at the same time the two-game winning streak of Hustle. Knicks looked well-organized offensively handing out 21 assists. It was a great evening for guard Kadeem Allen (191-93, college: Arizona) who led his team to a victory scoring 20 points, 5 rebounds and 6 assists. Guard Billy Garrett (198-94, college: DePaul) helped adding 20 points. Four Knicks players scored in double figures. The best for the losing side was Japanese guard Yuta Watanabe (206-94, college: G.Washington) with 23 points and 7 rebounds and guard Dusty Hannahs (190-93, college: Arkansas) scored 21 points (on 7-of-9 shooting from the field). Hustle's coach tested ten players, but that didn't help to avoid defeat in this game. Knicks maintains second place with 18-14 record having just five point less than leader Windy City B. Loser Hustle keeps the third position with 12 games lost. Knicks will face league's second-placed Sioux Falls Skyforce at home in the next day and it will be for sure the game of the week. Hustle will play against Maine Red Claws in Portland and it may be a tough game between close rivals. Not a big story in a game when 4th placed Blue Coats (9-16) were defeated on the road by second ranked Sioux Falls Skyforce (21-10) 134-123 on Friday. Sioux Falls Skyforce forced 22 Blue Coats turnovers. They looked well-organized offensively handing out 30 assists. Blue Coats were plagued by 25 personal fouls down the stretch. It was a great evening for swingman Duncan Robinson (203-94, college: Michigan) who led his team to a victory scoring 23 points, 6 rebounds and 4 assists. Burkinabe-American guard Bubu Palo (185-91, college: Iowa St.) helped adding 12 points, 11 rebounds and 8 assists. The best for the losing side was forward Cameron Oliver (203-96, college: Nevada) with a double-double by scoring 28 points and 14 rebounds (on 11-of-14 shooting from the field) and Rashad Vaughn (198-96, college: UNLV) scored 27 points and 4 assists. Both teams had five players each who scored in double figures. Sioux Falls Skyforce have a solid series of four victories in a row. They maintain second place with 21-10 record having just seven point less than leader Windy City B. Blue Coats lost third consecutive game. They keep the fourth position with 16 games lost. Sioux Falls Skyforce will face league's second-placed Knicks in Westchester in the next day and it will be for sure the game of the week. Blue Coats will play at home against Greensboro Swarm and it may be a tough game between close rivals. The most crucial game of the last day was another loss of top-ranked Long Island Nets (19-10) in Uniondale on Friday night. Hosts were defeated by second ranked Salt Lake City Stars (15-14) 109-96. It may be a crucial game in the contest for the top position in the league. Salt Lake City Stars looked well-organized offensively handing out 31 assists. Great defensive blocking was one of the keys in this match when Salt Lake City Stars made 8 blocks. It was a great evening for guard Isaiah Cousins (193-94, college: Oklahoma) who led his team to a victory scoring 21 points, 5 rebounds and 8 assists. Forward Tanner McGrew (203-93, college: W.Virg.Wesl., agency: Duran International) helped adding 25 points and 4 assists. The best for the losing side was center Alan Williams (203-93, college: UCSB) with 27 points, 5 rebounds and 4 assists and point guard Shannon Scott (191-92, college: Ohio St.) produced a triple-double by scoring 13 points, 11 rebounds and 11 assists. Five Salt Lake City Stars and four Long Island Nets players scored in double figures. Salt Lake City Stars maintains second place with 15-14 record having just one point less than leader Windy City B. Long Island Nets at the other side still keep top position with ten games lost. Very important is a home loss of first ranked Magic (17-11) against fourth ranked Greensboro Swarm (13-16) on Friday night. Host Magic was defeated by Greensboro Swarm in a tough game in Lakeland 98-106. It ended at the same time the four-game winning streak of Magic. The best player for the winners was point guard Anthony Barber (188-94, college: NC State) who scored 25 points, 5 rebounds and 5 assists. Guard Joe Chealey (190-95, college: Charleston) chipped in 19 points and 5 rebounds. At the other side the best for losing team was forward Amile Jefferson (206-93, college: Duke) who recorded a double-double by scoring 17 points and 17 rebounds and swingman BJ Johnson (201-95, college: La Salle) added 21 points respectively. Both teams had five players each who scored in double figures. Both coaches used bench players which allowed the starters a little rest for the next games. Greensboro Swarm maintains fourth place with 13-16 record. Loser Magic still keeps top position with 11 games lost. 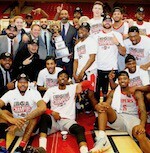 They share it with Capital City Go-Go and Raptors 905. Greensboro Swarm will meet Blue Coats (#4) in the next day. Magic will have a break next day. Everything went according to plan when first ranked Rio Grande Valley Vipers (20-10) outscored on the road 3rd placed Austin Toros (14-17) 129-98 on Friday. Rio Grande Valley Vipers looked well-organized offensively handing out 34 assists comparing to just 18 passes made by Austin Toros' players. Great defensive blocking was one of the keys in this match when Rio Grande Valley Vipers made 9 blocks. It was a great evening for German power forward Isaiah Hartenstein (211-98) who led his team to a victory with a double-double by scoring 32 points and 15 rebounds (on 11-of-13 shooting from the field). Guard Michael Frazier (193-94, college: Florida) helped adding 20 points, 6 rebounds and 5 assists. The best for the losing side was Ghanian center Amida Brimah (213-94, college: Connecticut) with a double-double by scoring 11 points, 10 rebounds and 7 blocks and swingman Lonnie Walker-IV (196-98, college: Miami, FL) scored 14 points and 8 rebounds. Both teams had four players each who scored in double figures. The winner was already known earlier in the game, so both coaches allowed to play the bench players saving starting five for next games. Rio Grande Valley Vipers have an impressive series of five victories in a row. They maintain first place with 20-10 record. Loser Austin Toros keep the third position with 17 games lost. Rio Grande Valley Vipers will face Texas Legends (#4) in Frisco in the next day. There was a minor upset in Des Moines where their close opponent Wolves (9-23) were defeated by fourth ranked Lakers (12-18) 117-101 on Friday. Lakers made 19-of-25 free shots (76.0 percent) during the game. They looked well-organized offensively handing out 25 assists. It was a great evening for German swingman Isaac Bonga (204-99) who led his team to a victory scoring 30 points and 9 rebounds. Brazilian-American guard Scott Machado (186-90, college: Iona) helped adding 19 points and 10 assists (on 7-of-9 shooting from the field). Lakers' coach used entire bench and allowed the starting five to rest. The best for the losing side was point guard Darius Johnson-Odom (187-89, college: Marquette, agency: BeoBasket) with 35 points (!!! ), 7 rebounds and 4 assists and guard Marquise Moore (188-94, college: George Mason) scored 19 points, 6 rebounds and 5 assists. Five Lakers and four Wolves players scored in double figures. Lakers maintains fourth place with 12-18 record which they share with defeated Wolves. Wolves lost seventh consecutive game. They keep the fourth position with 23 games lost. Important game to mention about took place in Bismarck. Second ranked Kings (18-11) saved a 1-point victory on the road edging leader Warriors (22-8) 105-104 on Friday evening. It may be a crucial game in the contest for the top position in the league. Kings made 20-of-24 charity shots (83.3 percent) during the game. Their players were unselfish on offense dishing 23 assists. Warriors were plagued by 25 personal fouls down the stretch. It was an exceptional evening for Nigerian forward Daniel Ochefu (211-93, college: Villanova) who led the winners with a double-double by scoring 23 points and 12 rebounds. Guard Cody Demps (193-93, college: Sacramento St.) accounted for 13 points and 7 rebounds for the winning side. Kings' coach allowed to play the deep bench players in such tough game. Guard Kendrick Nunn (190-95, college: Oakland, agency: Pensack Sports) came up with 30 points and guard Jacob Evans-III (198-97, college: Cincinnati) added 24 points, 6 rebounds and 5 assists respectively for Warriors in the defeat. Five Kings and four Warriors players scored in double figures. Kings maintains second place with 18-11 record having just one victory less than leader Windy City B. Warriors at the other side still keep top position with eight games lost.